Case 1. A 62 year old woman underwent a core needle biopsy of the right breast because of a mass detected on breast imaging. Image 1. Interlobular stroma is dense, and there is mild hyperplasia (left). A separate fragment of tissue is cellular and uniform (right). Image 3. Immunohistochemical study shows diffuse, strong nuclear expression of p63. Image 2. Apparent fibrovascular cores are beneath a proliferation of uniform cells. Diagnosis: Case 1: Dense stromal fibrosis and usual hyperplasia without atypia. Case 2. A left lumpectomy and sentinel lymph node biopsy were performed on a 73 year old woman. Image 6. 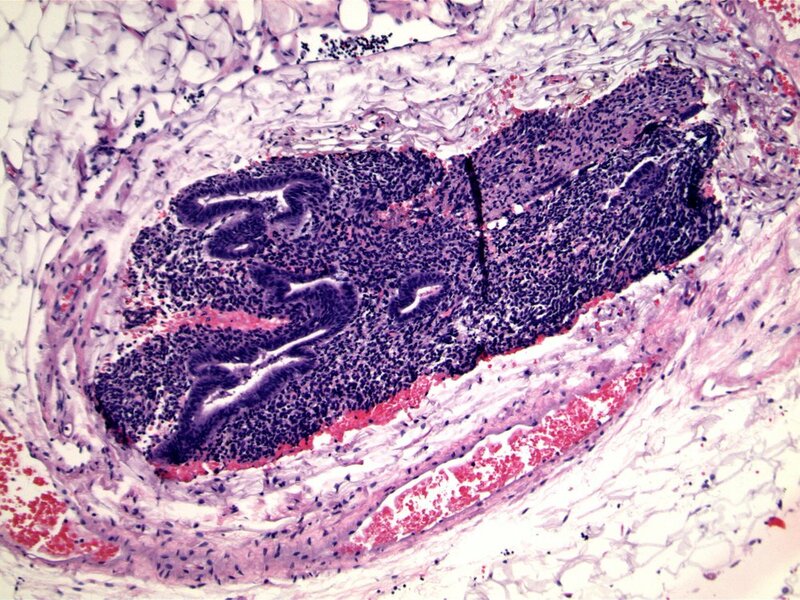 Bland columnar epithelium is associated with small round to oval blue cells. Diagnosis: Case 2: Invasive cribriform carcinoma, negative sentinel lymph node. Discussion: Both cases illustrate the danger of ‘floaters’. The floater in case 1 is a low grade urothelial tumor, which clearly is a detached tissue fragment. The apparent fibrovascular cores are actually vascular submucosa. The core biopsy procedure was performed because of a nodule, which is explained by the stromal fibrosis. The floater in case 2 is especially tricky, because there is clearly a lymph node (image 5, left), however a comparison of the glandular structures associated with the node and the primary breast carcinoma shows no similarity. Careful scrutiny of the glandular epithelium and associated stroma allows recognition of this area as endometrium which has been 'pushed' into the perinodal fat. The dense endometrial stroma superficially resembles lymphoid tissue. Although tissue is submitted to the laboratory as being from a specific breast lesion, tissue floaters can happen at many levels in tissue processing and slide preparation. Being aware of that possibility when patterns don't quite 'fit' is essential, and requires the pathologist to show critical judgement. A 48 year old woman underwent stereotactic core biopsy because of calcifications identified on mammography. A 55 year old woman had a core biopsy of a mass in the skin of her left breast. She also had skin lesions on her abdomen. A 68 year old woman underwent an excisional biopsy because of architectural distortion. An 82 year old woman underwent a lumpectomy following a needle core biopsy.